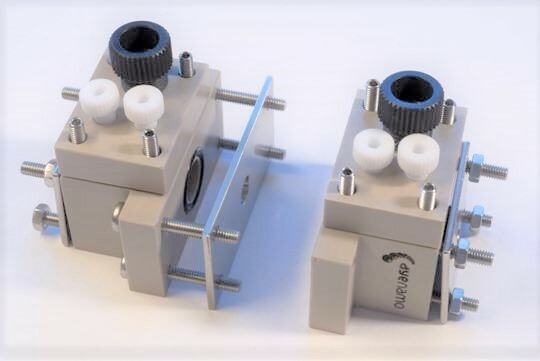 Dyenamo's multifunctional photo-electrochemistry (PEC) H-type (HT) tandem-holder has been designed to improve and facilitate your solar fuel experiments. The patent-pending product has been developed by Dr Haining Tian at Uppsala University. The HT-holder consists of two air-tight chambers with in/outlets for gas that are separated by a ion permeable membrane. Photo-electrodes are easily assembled on the outside wall of each chamber providing a highly light-transmitting setup, avoiding unnecessary light-refraction. The light-active area is well controllable by a mask, which also diminishes the electrode-edge light reflection in your test and provides you more accurate, reliable and reproducible results. In addition, it is straightforward to align the photo-electrodes, particularly in the tandem PEC experiments. There is one port in each chamber for use of reference electrode (diameter: 6 mm). All components in the HT-holder can be disassembled, which is beneficial for thorough cleaning of the holder. Moreover, DN-PH01 can be used for other experiments, e.g. spectro-electrochemistry, electrolysis and light-driven organic synthesis. Various pieces of analytic equipment can be integrated with the holder to make your experiment evaluation online. This is a Dyenamo patent-pending product.